Tuscan decorating style for a traditional Tuscan style bedroom: Authentic Tuscan bedroom decor and Tuscan bedding. The pictures on this page were all taken in old Tuscan farmhouses - houses that have been in the respective families for generations. Some continue to be used as working farms, with olive groves, vineyards, and large kitchen gardens. ... and the owners are using a traditional Tuscan decorating style to continue, in spirit, the characteristic simplicity of their ancient homes. They're minimally decorated, mostly with framed old family pictures and prints (many of the prints have either a botanical or a religious theme). 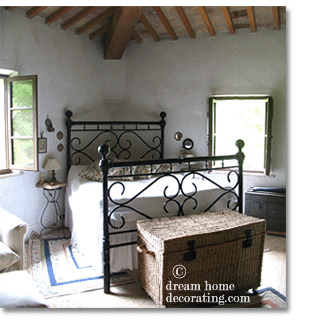 Traditional Tuscan beds have robust, blackened, wrought-iron frames. They're usually covered with simple white matelassé bedspreads. Truly rustic Tuscan bedding (as well as window treatments) are an all-white cotton affair. The nightstand to the right is typical of the traditional Tuscan decorating style. It is quite high; about 30cm higher than the top of the mattress. Made of brown polished wood, with sparse decorative detail, it is topped with a slab of white, veined marble. They're both made from antique wash stands. The one to the left still has the original porcelain wash bowl sitting in the top ring, which in turn holds - slightly askew - the reading lamp, as well as all the kinds of stuff you'd want close by at night. Underneath the washbowl, you can still see the little enamelled tin plate that used to hold the soap. The small round mirrors on the wall 'echo' all the circular shapes below - a nice touch that visually pulls the space together. The iron stand has lost (or been stripped of) all things to do with washing. The empty top ring was turned into a table with the help of a thick, rough terracotta floor tile. And the metal plate near the floor, underneath the soap dish, where the large jug with water used to sit in the days before running water and bathrooms, is now home to a small but perfectly formed ... candleholder. Beyond the all-natural color scheme of a rustic Tuscan decorating style, the owners of this farmhouse have added a few lovely details that give their home a contemporary, fashionable twist. On the bed in the background, there are a couple of cushions covered in a floral print. Do you see the ones I mean? They're red, pink, violet, with a bit of yellow and green, on a white ground. The same fabric reappears on the wall, as an 'upholstery' fabric for several of the mirror frames. I really like this idea. The simple geometric shapes of the fabric-covered frames are softened by the padding, and the frames are wide enough to set off the lively, large-scale print. At the same time, they perfectly complement the more ornate and gilded frames in the group. The printed fabric connects the wall decor with the bed and creates a unified, very feminine space. The chest of drawers in the picture to the right does not look all that rustic, but it works perfectly within a simple Tuscan interior. The owner has 'crowned' it with a beautifully carved Italian mirror, and decorated the white marble top with antique hairbrushes and white porcelain. This isn't generally the kind of decor you're likely to find in most smaller farmhouses. The traditional Tuscan decorating style for rustic bedrooms is mostly on the frugal side, with very little ornament at all. Take, for example, the Tuscan armoire in the picture to the left: It's about 120 years old. Dark-stained wood, good proportions, a bevelled mirror set into the door - that's all you need for a Tuscan style bedroom. This is the kind of beautifully simple, almost austere Tuscany furniture I have come across on several occasions in smaller farmhouses. You can find similar mirrored armoires all around Europe, and in many other parts of the world. Alternatively, you could have a Tuscan armoire like this made to order without problem. Now, if you would like to design your interiors in a slightly more 'citified' Tuscan decorating style, keep reading - you have a host of further options at your disposal. For example, the photo to the right shows part of an art nouveau bedroom suite (bed, wardrobe, nightstands & chest of drawers) in wood. It was made in Tuscany around the turn of the 20th century; in Italy, the style is called Stile Liberty. You'll find more information about this, and about creating the look of Tuscan bedroom design, in Part II of this mini-series about decorating a bedroom, Tuscan style. Learn more about Contemporary Tuscan Bedroom Decor (including the use of White Metal Beds). Learn about using neutral color palettes with a Tuscan decorating style. Understand what makes neutral color schemes look their best, and what happens when you inject 'real' color into neutral color palettes. It's FREE!! Return from Tuscan Decorating Style to Tuscan Decor. Return from Tuscan Decorating Style to the Dream Home Decorating homepage.